Stepping into the Past, Days 7-12: Athens, Greece to the south and the north and back to Athens. When we began planning a visit to Greece, our original idea was, of course, to include a few of the Greek islands. 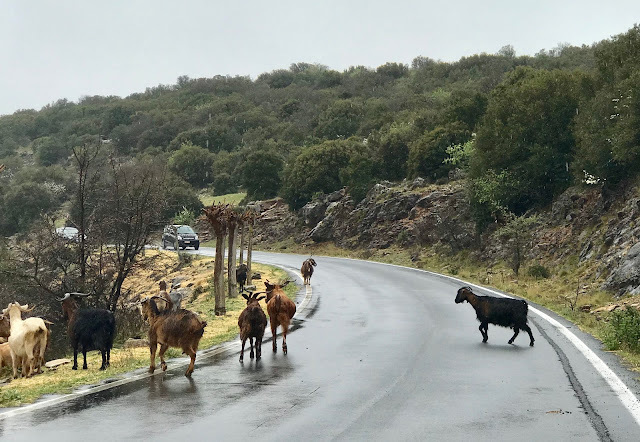 It didn't take much research to uncover that we would be arriving at the beginning of the peak Greek tourist season. While that date marker wouldn't be too significant in a country such as Albania, Greece sees 32 million visitors annually, most of them between April and August. And the islands bear the brunt of that invasion, including daily mass influxes from overflowing cruise ships. Setting our sights in a different direction, we turned for guidance to our 'traveling and learning' role model, Uncle Joe. After a military career, this inspiring family legend traveled the world, making stops in almost 90 countries before falling victim to cancer in 2016 at the age of 84. His last journey abroad was a 2015 Greek road trip, and since he always shared his itinerary, our road trip plans got a big fat jump start. 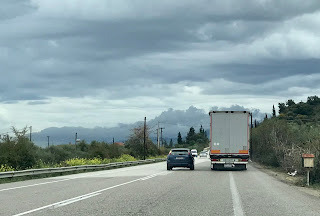 Leaving Athens, we drove west toward the Peloponnesian peninsula. 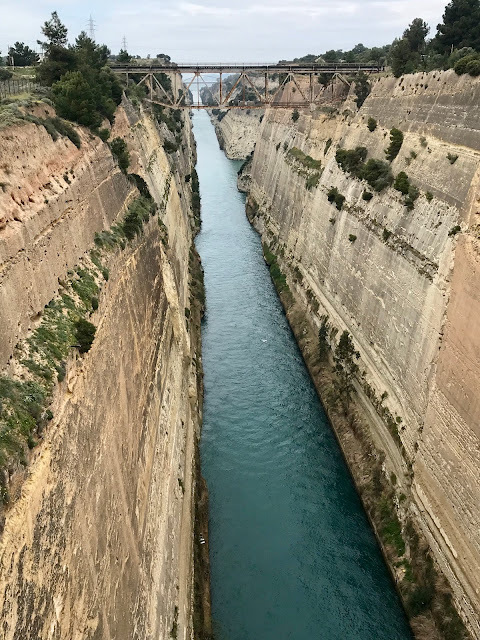 Near the city of Corinth, we made our way to the Corinth Canal, a channel which connects the Adriatic Sea with the Aegean and cuts a slice out of the peninsula where it joined the Greek mainland (leading some to question whether it's still a peninsula or now an island). Though the idea of a canal here was conceived as early as 602 BC, it was too complicated to accomplish with the existing technology, and a portage road was built instead. Again in 300 BC, an attempt was considered, but engineers convinced the Macedonian king in power that the Adriatic would flood the Aegean if the canal were built. In the Roman period, efforts were stalled for the same reason until Nero in 67 BC ordered 6,000 slaves to build the canal. Upon Nero's untimely death, the project was again scrapped. It wasn't until the Greeks regained their independence in the 1830s that the idea resurfaced. High costs led to a few false starts, but the structure was finally completed in 1893. A few love locks and hundreds of tissues and plastic wrappers adorned the pedestrian bridge. Unfortunately the canal never attracted the expected level of use due to its narrow width (82 ft) and the strong winds channeled by its high walls. Today it is used only for day tours and small cruise ships. Predictably, it is also a favorite spot for bungee jumping. In 1944, German forces retreating from Greece after being ousted by the Allies, took out their eviction revenge on the canal. After detonating explosives to cause a landslide of its fragile limestone walls, they destroyed the bridges and dumped train cars and bridge wreckage into the canal to hinder repairs. The US Army Corps of Engineers came to the rescue in 1947 with a ten-month project to clear and reinforce the Corinth Canal. On a personal note, one of the staff members for the project was our Aunt Bea, Uncle Joe's first wife. 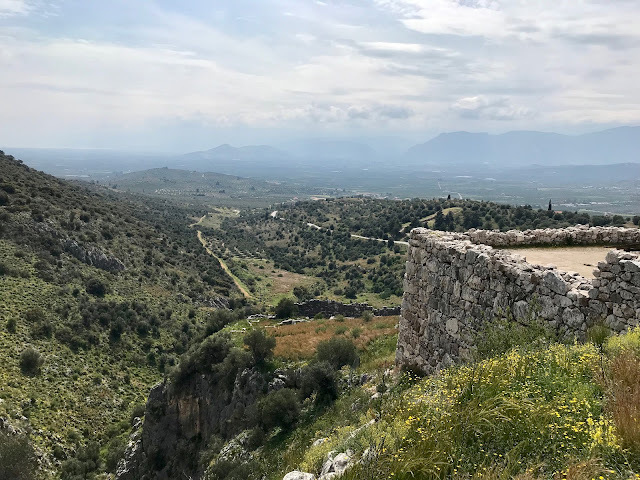 From Corinth, we continued southwest, following UJ's plan, to the archaeological site of Mycenae, a fortified hilltop citadel nestled between two larger hills. The Mycenaean culture dominated mainland Greece, the Aegean islands, and parts of Asia Minor during the late Bronze Age (1600-1100 BC). According to Greek lore, the fortress settlement at Mycenae was founded by the legendary hero Perseus. More than 30,000 people lived at Mycenae in the 13th century BC. 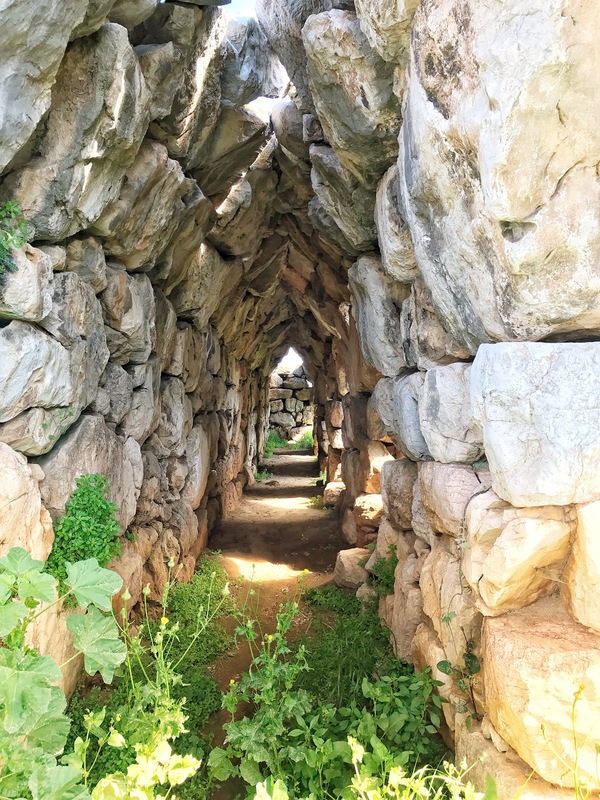 Giant stones used in the construction of the outer walls inspired a mythical explanation that Perseus employed a group of Cyclopes to construct the barrier, for surely mere humans could not have moved the enormous boulders. Thus they are described as Cyclopean walls. The most distinctive feature of the fortress is the Lion Gate, built in 1250 BC (yes, that's 3,269 years ago!) to guard and provide the main access to the citadel. Archaeologists indicate that the gate was closed by double heavy wooden doors secured by a sliding bar. Examples of stirrup jars (1150 BC) in the museum, used for storing wine and oils. 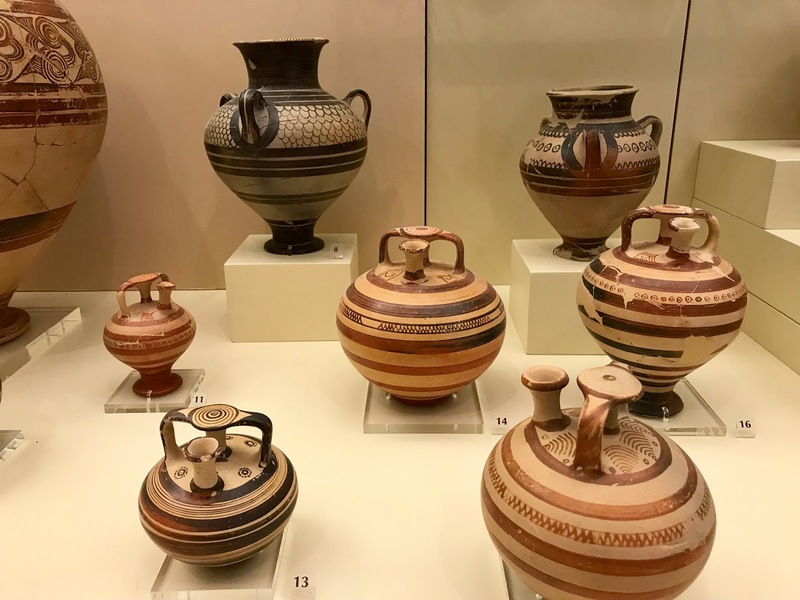 The Mycenae Archaeological Museum, located on site next to the citadel, exhibits part of the incredible wealth of artifacts unearthed at the site. 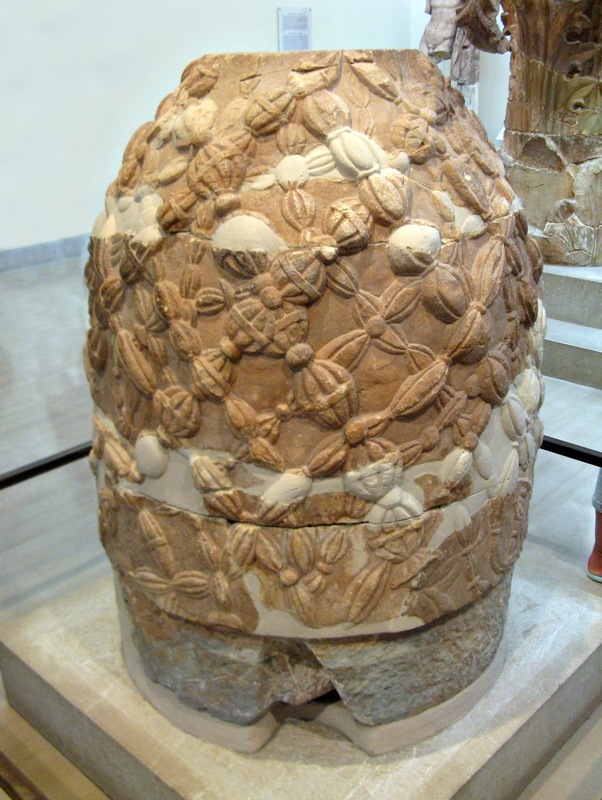 When excavation began at Mycenae in the 19th century, the items discovered caused a sensation. Early digs yielded a wealth of grave goods, items made of gold and precious jewels buried with a body to smooth the journey of the deceased into the afterlife or to appease the gods. 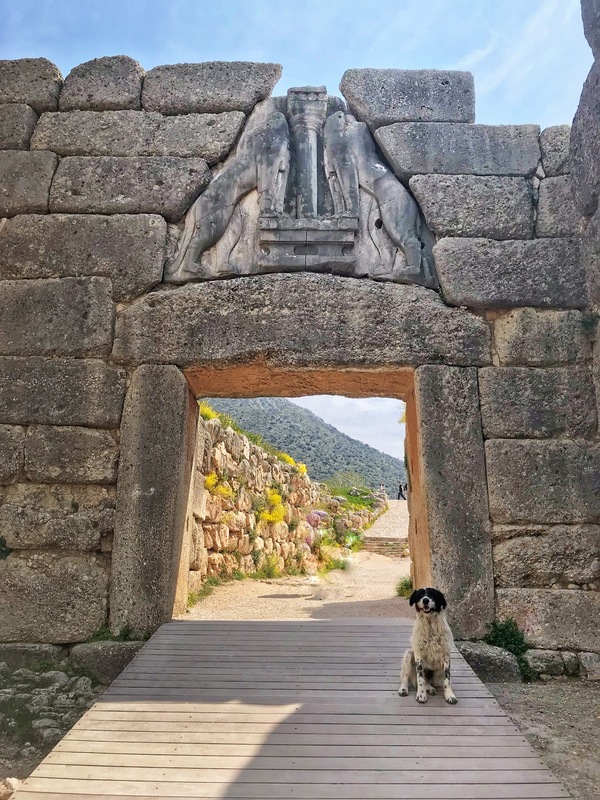 Mycenae was our last stop on the way to the seaside village of Nafplio, a stop on Uncle Joe's itinerary. When we awoke there on Saturday and looked out the window, we exclaimed, "Oh, boo! A rainy day." That was quickly followed by, "Oh, yay! A rainy day." It was Day #8 of the trip and we were in need of a little respite. 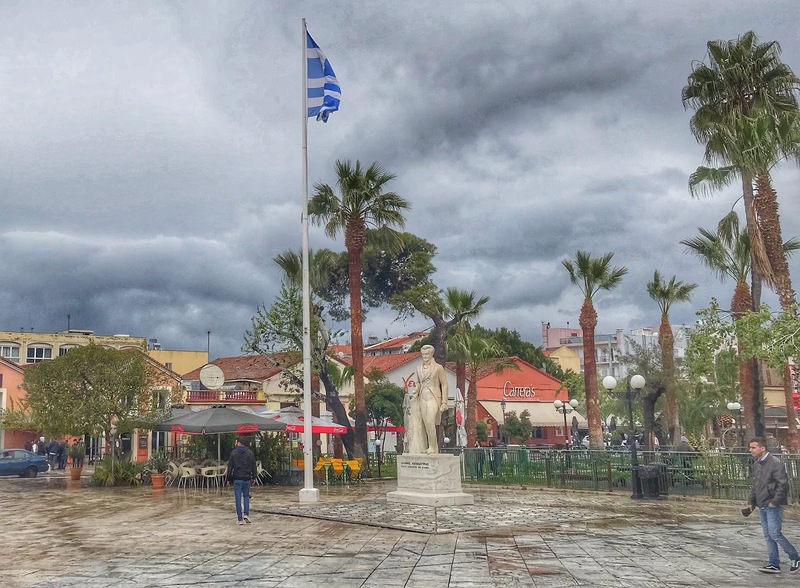 The "time out" gave us an opportunity to finish the Athens blog post and chill a bit. We also learned a valuable lesson in Nafplio about Greek restaurant practices. Twice in two days, I ordered a salad at local restaurants. And twice, the fresh healthy greens were drowned in a puddle of oily, sugary salad dressing and olive oil, rendering them all but inedible. This experience served me well. A couple of days later in Galaxidi, I ordered a salad with no dressing. The server could not believe his ears. "No dressing!?" he exclaimed. "No dressing," I replied. He wasn't back in the kitchen three minutes before he returned to the table and asked, "But you want olive oil and honey on the salad?" "No," I replied, "nothing." Shaking his head, he returned to the kitchen and later abashedly delivered a beautiful fresh, uncontaminated, delicious salad to our table. I relished every refreshing bite! Before our departure from Nafplio on Sunday, we took advantage of the improved weather and checked out Palamidi Castle high above the town. Did we climb the 999 steps to the top, as the young innkeeper, a lifelong resident, told us she had done only once and would probably never do again? No, we asked our little Hyundai to take us there, picking up two young Latvian hitchhikers who had run out of steam on their way to the top. 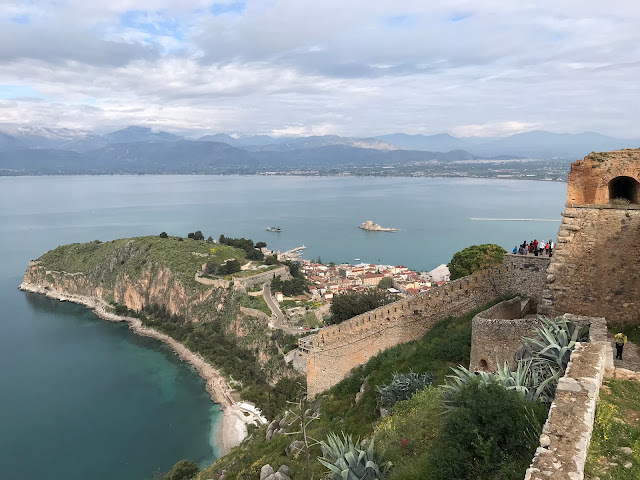 In the panoply of Greek history, the castle at Nafplio is a newbie, having been built by the Venetians during their second occupation of the area in the early 1700s. 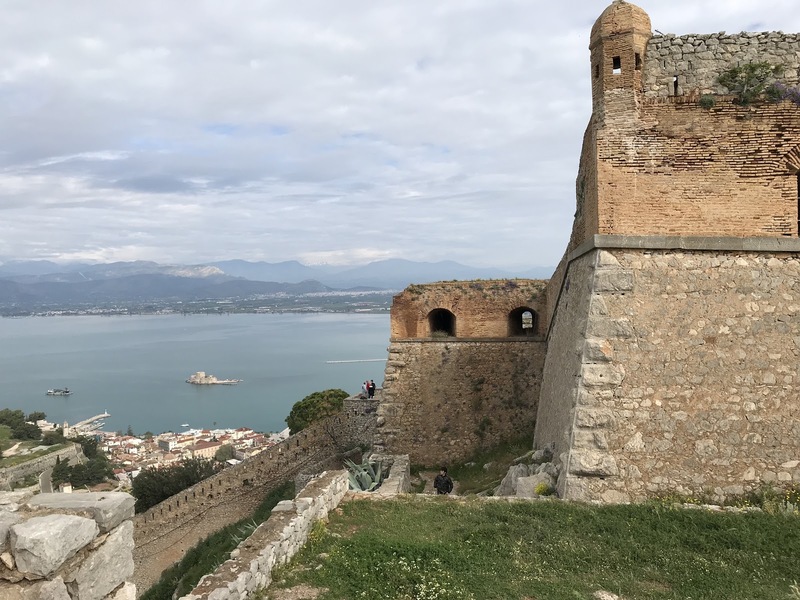 The year after the fortress was occupied, it was captured by the Turks, who completed construction of the massive complex with the Venetian architectural plans and held the citadel atop the 708-ft hill until the Greeks reclaimed the promontory in 1822. Just three miles northwest of Nafplio, we came upon another of Uncle Joe's picks—the UNESCO World Heritage Site at Tiryns, a hill fort first settled more than 7,000 years ago. 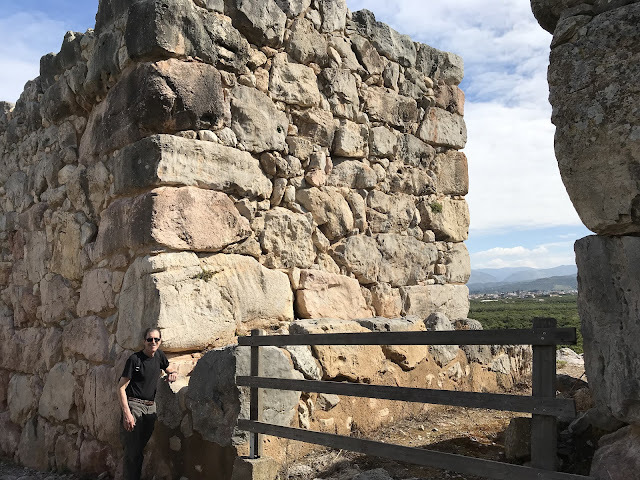 What remains there today are remnants of city walls built in the Mycenaean era, around the year 1300 BC. Tiryns has its own version of Cyclopean walls—up to 33 feet thick and made of stones weighing as much as 13 tons. 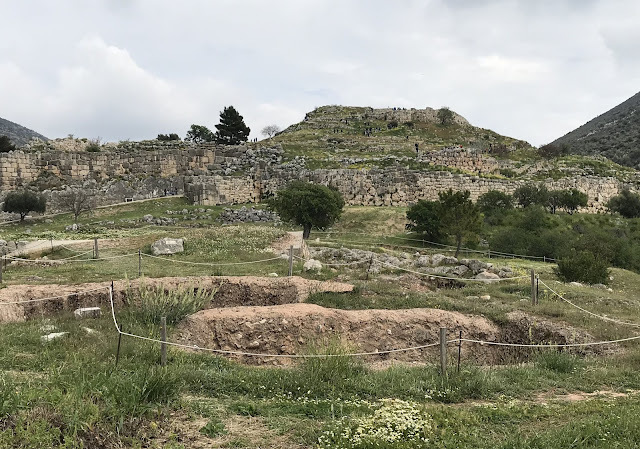 What makes Tiryns especially interesting are the long passages under the acropolis between the outer and inner walls. The surfaces of these tunnels have been worn smooth by all the sheep that have found shelter there over the centuries. Into each life some rain must fall, and into each road trip, some drama. Ours came on Sunday between Nafplio and Olympia, which should have been a simple 2.5-hour trip. The first sign of trouble appeared after a brief stop in Argos to check out its ancient theater. Archaeological evidence indicates that people have lived at Argos for more than 7,000 years, making it what some consider the world's second oldest continually occupied town behind only Jericho. 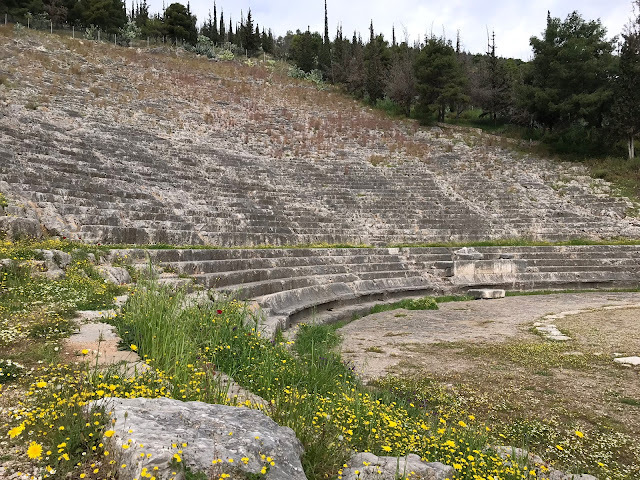 Built in 320 BC, the Argos theater seated 20,000 and was one of the largest Greek theaters. Upon our departure from Argos, we struggled to escape the adjacent rural area because we needed to cross the Inachos River. 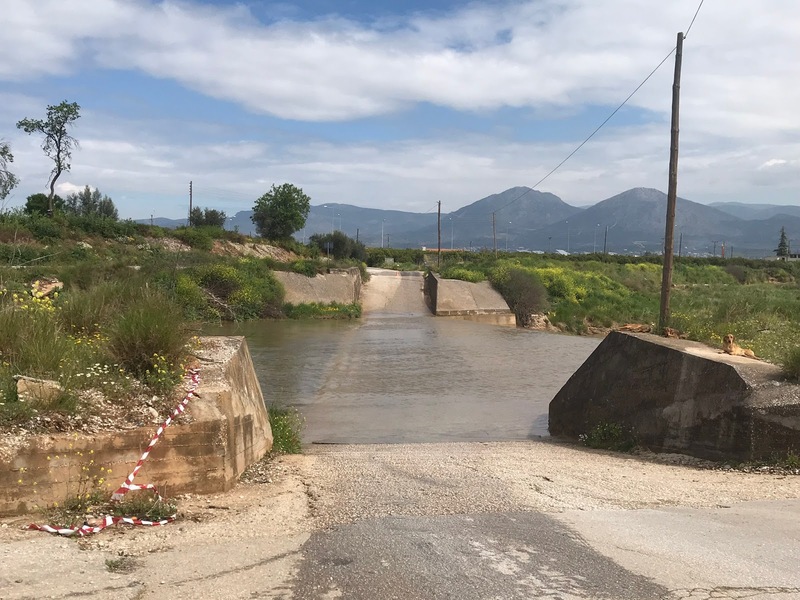 Lady Garmin, our GPS, took us on a tour of local orange and olive groves leading to one ford after another, all of which were impassable that day, especially in our low slung little hatchback. At last the GPS offered up a road with a bridge (a bridge!). Once across the river we soon found ourselves on Route E65, a pristine limited access highway with roadside WCs and full-service rest areas. 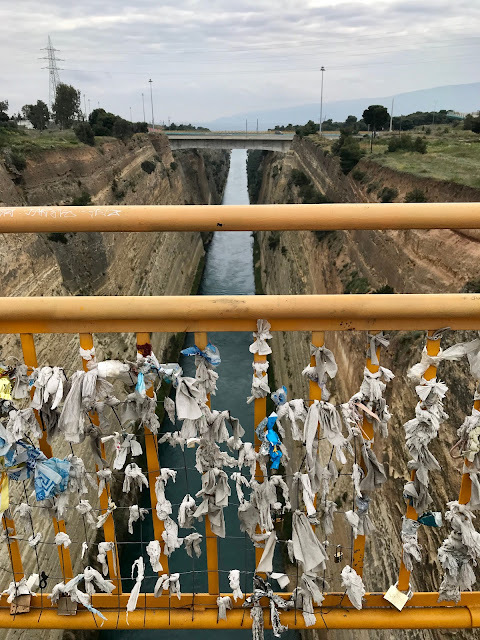 The wrinkles had smoothed out and it looked as if we would arrive in Olympia in time to visit the archaeological site that afternoon ahead of the next day's forecast rain (again). Ha! You had to know that wouldn’t last after all the false river crossings. 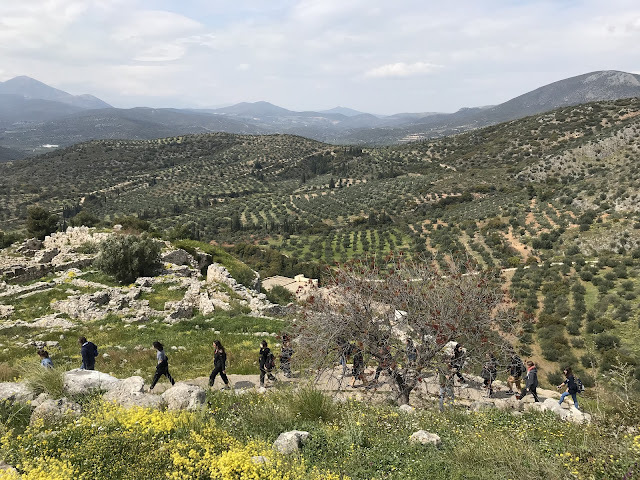 Following a short distance of easy, care-free travel, the GPS guided us onto Route 111, a serpentine course that took us up through the Taygetus Mountains. At an intersection near the tiny village of Karkaloy, a prominent sign in the roadway blocked the turn we needed to make and commanded our attention. 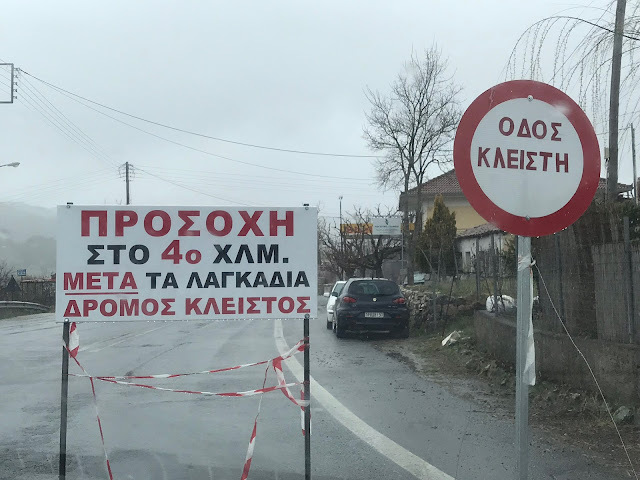 Unable to read the sign in Greek, and with no cell signal to obtain a translation, we took a photo of the sign and showed it to an attendant at a nearby gas station, the only sign of life at the crossroads. In this remote area, of course, the older gentleman did not speak English. But clever guy that he was, he intuited that the nuts in the rental car showing him a photo of a detour sign were obviously tourists trying to find their way to the nearest popular town. “Olympia?” he asked. When we answered in the affirmative, he pointed to the alternate route. At that point, we were 42 miles from Olympia. 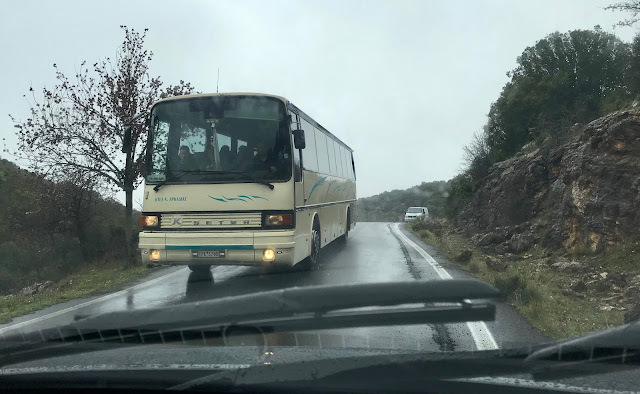 Predictably, rain had begun falling just before this incident occurred and continued in earnest as we traversed what quickly became a single-lane track perched on a ledge winding through the mountains. 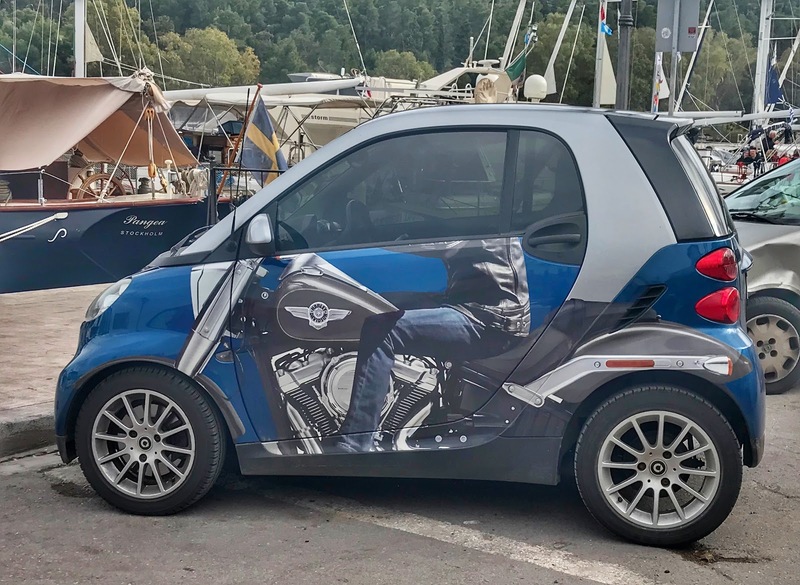 The GPS didn't exactly inspire confidence, and we had no cell signal to use Google Maps (and had epically failed to download offline maps for the area). When we had directions like "Turn left on road," we pondered whether Garmin knew where we were, let alone where we were going. 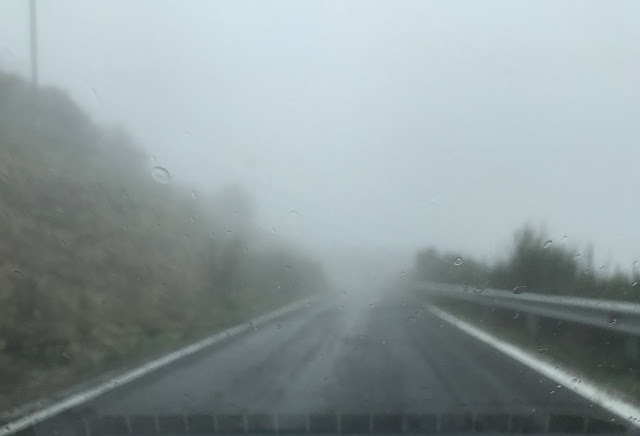 At higher elevations, fog shrouded the narrow lane, and few of the oncoming cars were using headlights, offering us a series of heart-stopping surprises. Pea soup might be clearer. After an hour and 45 minutes of this melodrama, we finally reconnected with Route 74, no freeway itself, but mostly two-laned. Though we had often wondered whether we could have rejoined it earlier, an identical detour sign at the spot where we made the turn convinced us Garmin actually did guide us well. By the time we arrived in Olympia, the trip had taken us more than six hours, and the ancient site had closed for the day. All was not lost, however, as the hotel Uncle Joe had selected boasted beautiful grounds, a pleasant place for our daily walk. Early the next morning, thunderclaps woke us to confirm the forecasters' accuracy, spoiling our plans to wander the ruins of ancient Olympia. But there was still the highly rated museum to visit. Oddly, we weren’t the only ones with that idea on a rainy day. When we arrived, sixteen tour buses (no exaggeration) were already there. “Step on it!” I suggested, and Ken happily complied, putting our little hatchback on the road north. 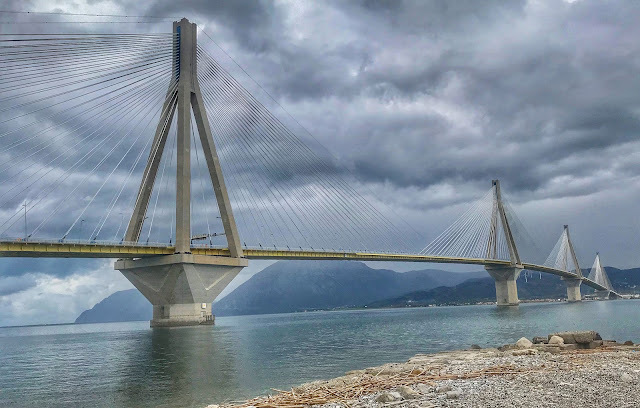 As an engineer, of course, Uncle Joe was fascinated by the Rio-Antirrio Bridge spanning the Gulf of Corinth between the Peloponnese peninsula and mainland Greece. 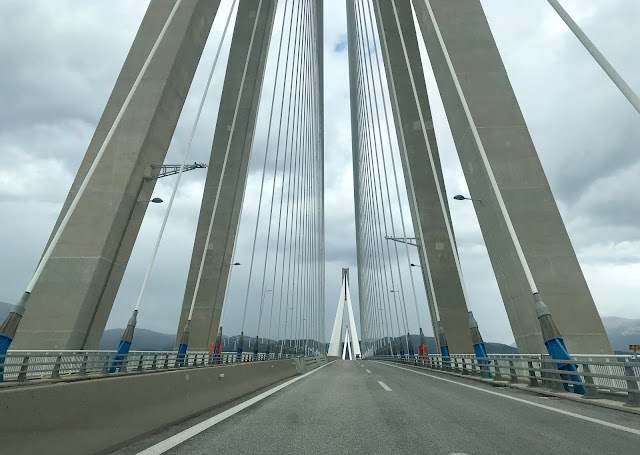 Grateful he had put it on the itinerary, we were also impressed with the world’s longest suspended cable-stayed bridge. Widely considered to be an engineering masterpiece, the structure is no slouch in the eye candy department. Its location required specialized technology and design to overcome the challenges of deep water with a soft seabed, frequent seismic activity and the daunting probability of tsunamis. All the uncommon features to address those needs did not come cheap. The bridge cost upwards of a billion dollars to build, explaining the $15 toll still in effect. Construction took almost ten years with the official opening fittingly held a week before the 2004 Summer Olympics in Athens. Olympic torch bearers were the first to cross the bridge, no doubt in one of its pedestrian lanes. 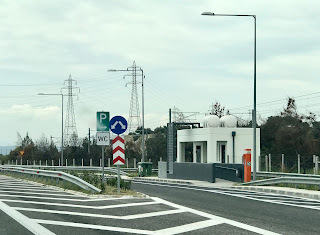 On the Greek mainland, we continued up E-65, a pan-European highway that extends from Sweden to southern Greece. The Greek section that follows the Gulf of Corinth coast from the bridge to Galaxidi offers up some stunning scenery. We've driven California's Pacific Coast Highway, Nova Scotia's Cabot Trail, Australia's Great Ocean Road, and Ireland's Dingle peninsula—all of them breathtakingly beautiful scenic drives. 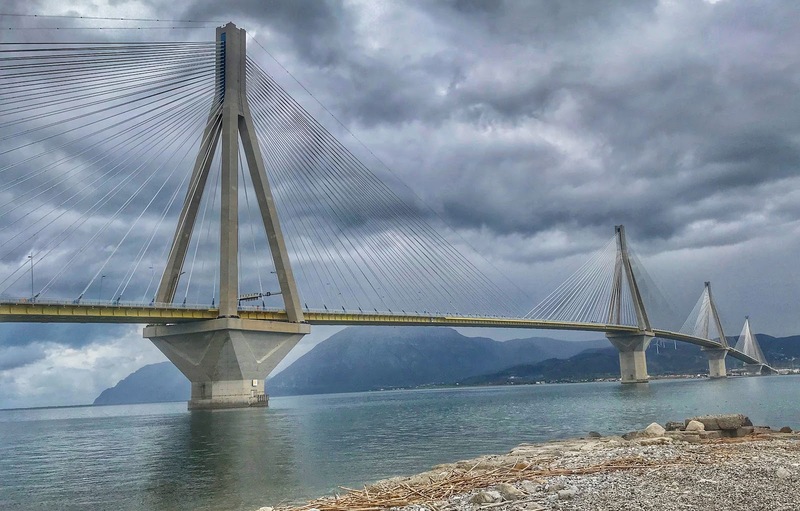 In our opinion, the Central Greece Motorway can compete with any of them. The only highway in our experience that leaves the E-65 and all the others behind is Italy's Amalfi Coast. 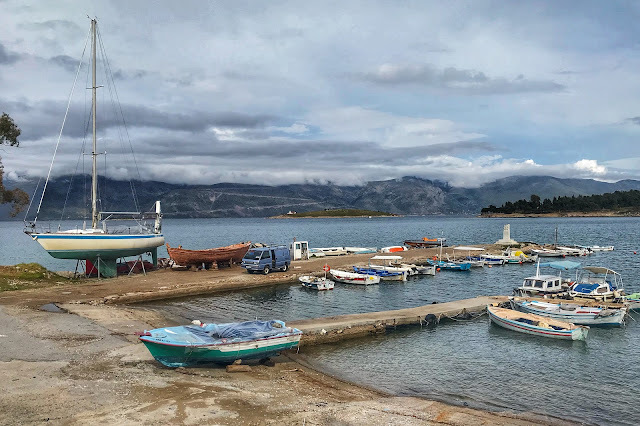 Following Uncle Joe's lead, we made the picturesque coastal village of Galaxidi (pronounced gal-ick-city) our base for visiting the nearby area. (It was here where I finally ordered and delighted in a salad without dressing.) Located at the base of Mount Parnassus, the town, which dates back to at least the year 981, has a natural port situated on a double harbor surrounded by mountains. Once one of Greece's busiest and wealthiest ports, Galaxidi experienced a decline in the early 20th century as it failed to make the shift from sails to steam. 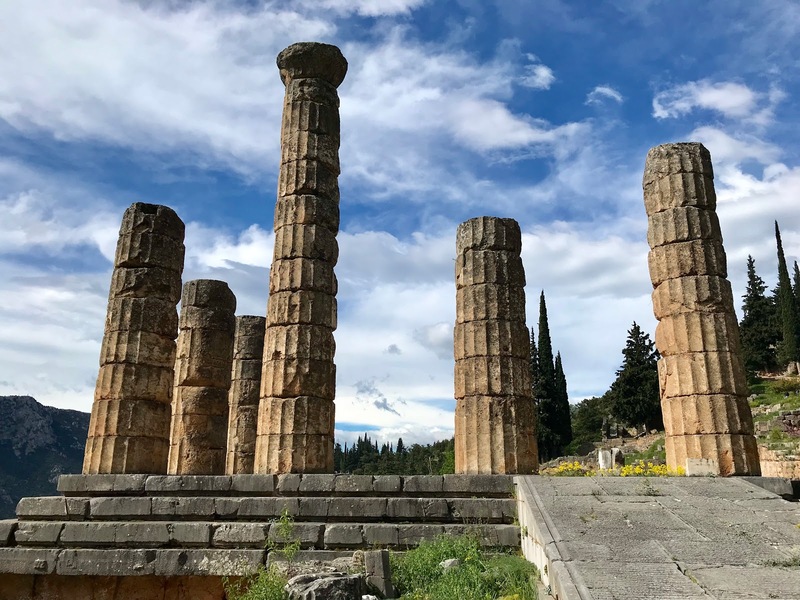 Located near the famous archaeological site of Delphi, it has become a popular spot with tourists in recent decades, as well as a yachting destination. The real jewel in the crown of central Greece is the extensive archaeological site of Delphi. 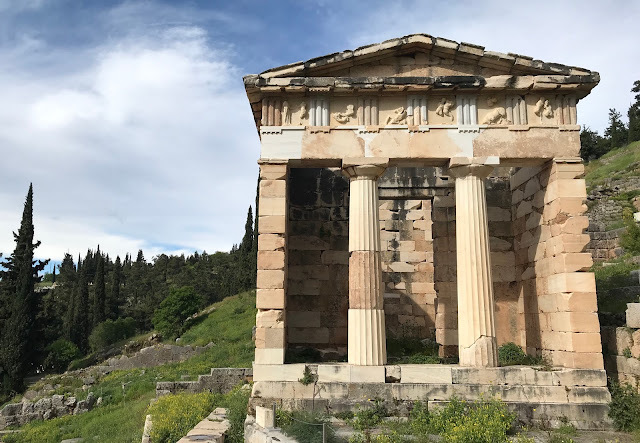 It became famous as the ancient sanctuary that grew rich as the seat of Pythia, the high priestess and oracle who was consulted about important decisions throughout the classical world. Delphi occupies an impressive site on the slope of Mount Parnassus. 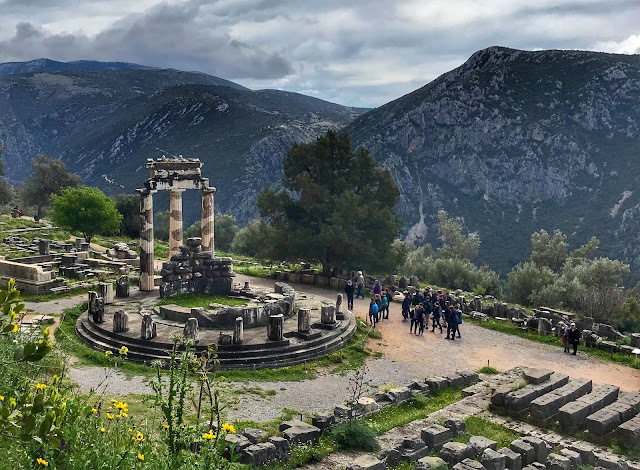 In ancient Greece, Delphi was believed to be the center of the world. According to legend, Zeus attempted to locate the center of the earth, by sending two eagles in flight from the "ends of the world." Flying at equal speed, the eagles were said to have crossed paths here. From the spot where they crossed, Zeus threw a rock from the sky and it landed at the place that became Delphi, to be known as the omphalos ("navel of the world"). 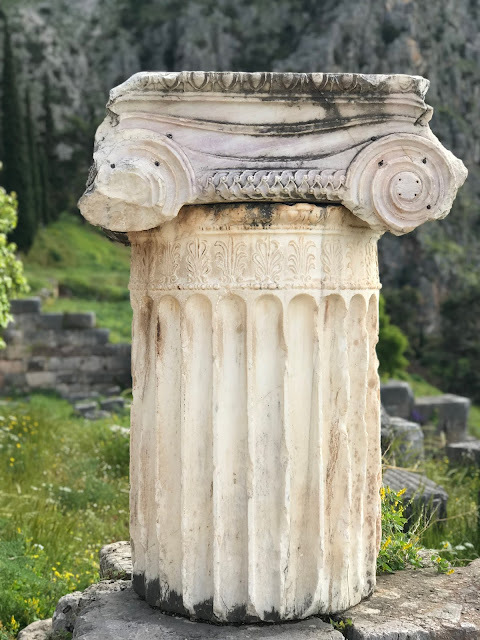 An omphalos stone was carved in marble and mounted at the top of a column in ancient Delphi to commemorate its significance as the center of the world. Today this stone, or an ancient replica (scientists can't agree on which) is housed in the excellent museum at the Delphi Archaeological Site. 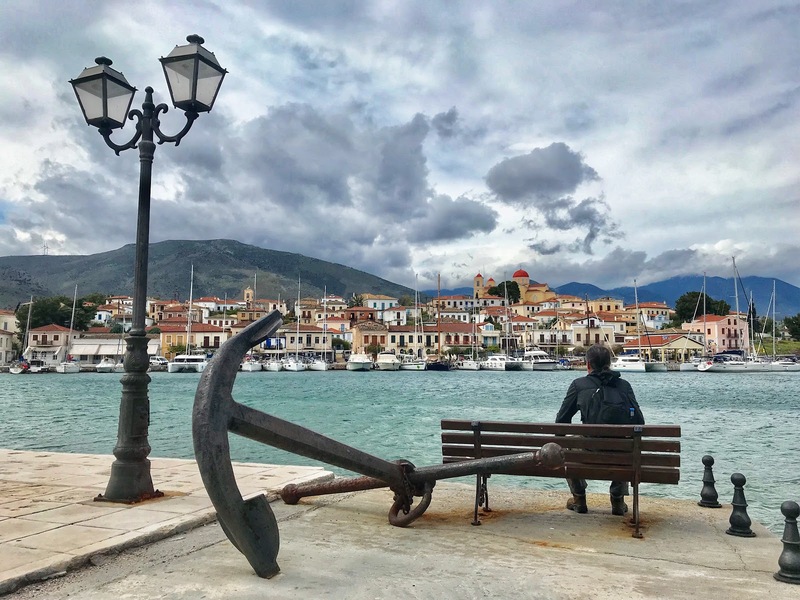 On Wednesday, we left the cozy village of Galaxidi behind and returned to Athens. Scenery along the way was nothing special once we left the coastal area. Thanks to Uncle Joe, the road trip had been all that we hoped for. Our only regret was not making it to Meteora and Thessaloniki. We'll just put them on our itinerary when we return to visit the islands in the off season. 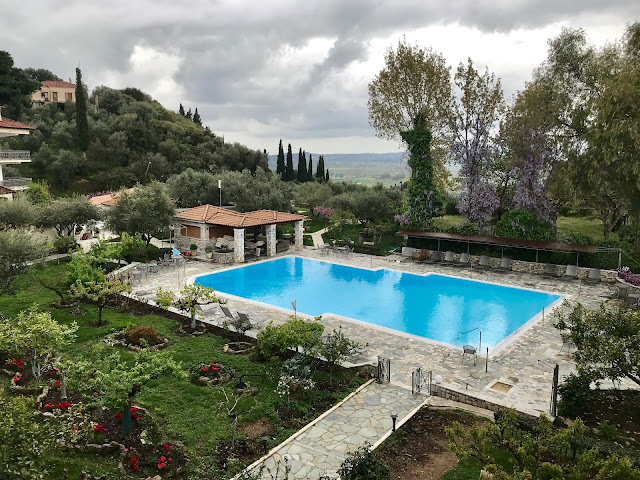 At the end of our big fat Greek road trip, we were left with fond memories and a burning desire to return to this beautiful land steeped in history and mythology. 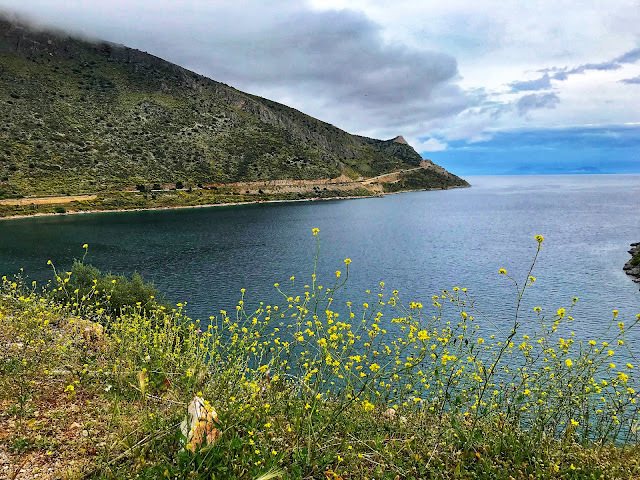 The next leg of our journey will take us to the island of Cyprus, which has an intimate relationship with Greece and deep historical roots as well. It's a member of the European Union but often considered part of western Asia or even the Middle East. We're eager to see for ourselves. Loved: Following in Uncle Joe's footsteps and appreciating the planning he completed and shared. Lacking: Clear weather for visiting Epidaurus (from Nafplio) and Olympia. Learned: What history really means. Not just the most recent few hundred years. In the perspective of Greece, that's more part of the present than the past. 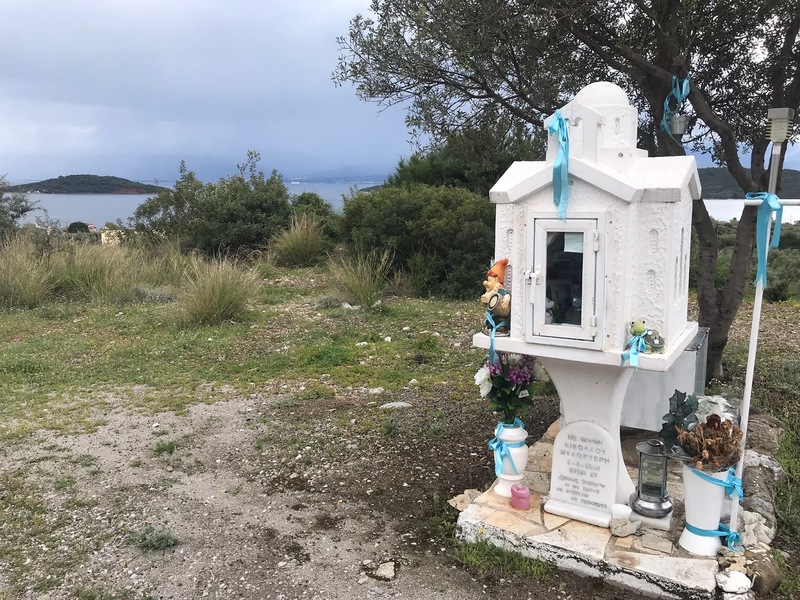 Small roadside shrines are a common sight along the highways in Greece. Usually designed in the shape of a miniature church or house, elevated on a column about waist high, the memorials commemorate individuals who died in an accident at that spot. In a shoebox-size interior, a lamp or candle burns in memory of the deceased. A sun-faded photo of the individual rests inside along with a few personal mementos, images of saints, plastic flowers, and an extra bottle of oil for the lamp. Called kandilakia, these poignant tributes, some elaborate, some simple, are often faithfully maintained by loved ones. This little shrine was on the coast on the way to Delphi. One of travel's most interesting aspects is observing how different cultures deal with the quotidian matters that affect us all, regardless of where we live. Some we'd love to see imported into the United States, though others might not work so well in our homeland. 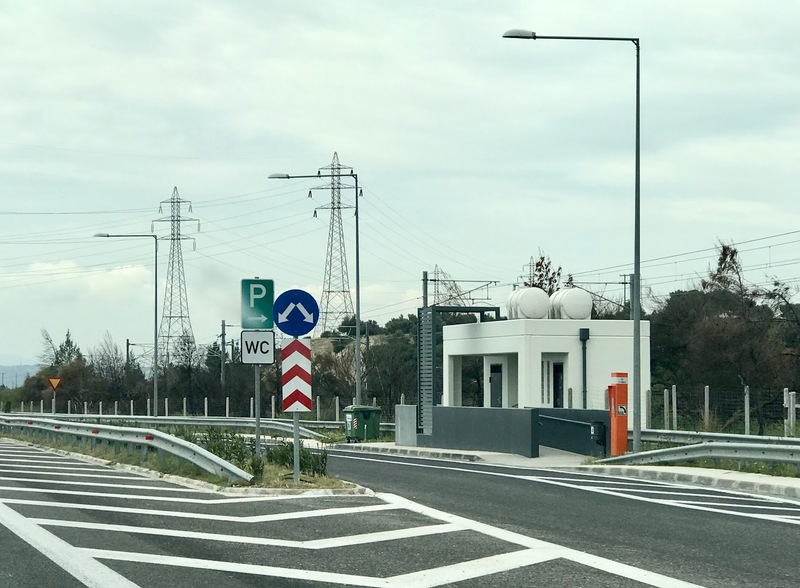 We have no doubt that one feature we've seen on primary limited access highways on this road trip would quickly gain widespread support most anywhere: immaculately clean roadside relief stations. At times, we've all experienced a desperate need for just such a facility, spaced out every 15-20 miles. Yes, please! Are you listening, US Department of Transportation? There are so many practices that we could adapt from other countries and cultures that would make life in the U.S. easier for everyone. Here's another. We have seen this in other countries, especially in eastern Europe, and it definitely is worth duplicating. Life on the highway would be so much safer if roads were equipped with a wide shoulder, which allows for faster drivers to pass slower ones with a minimum of danger. Eventually we'd all learn to move over when the vehicle behind us wants to overtake. 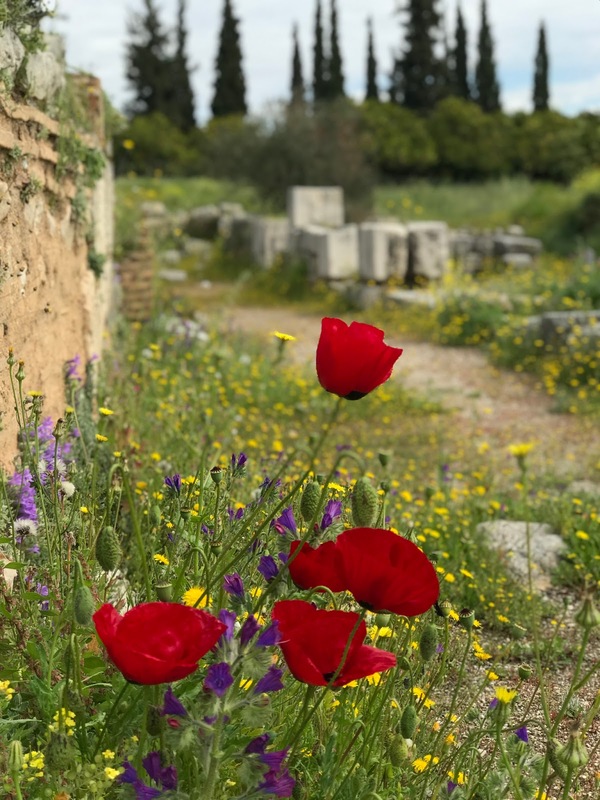 Wildflowers are in bloom everywhere, including near the ancient theater at Argos.